Outlet There are 54 products. Beautiful ivory freshwater pearls contrast with dark amethyst rondels and a dark purple swirling lampwork heart. A beautiful faceted black onyx rounded teardrop is combined with a smaller faceted black onyx teardrop, faceted moonstone rondel, snowflake obsidian and white freshwater pearls. This silver necklace you can truly make your own. 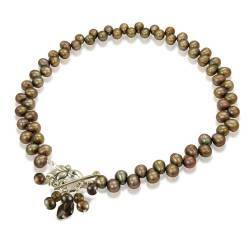 This necklace has a decorative silver bead and rondel bead. 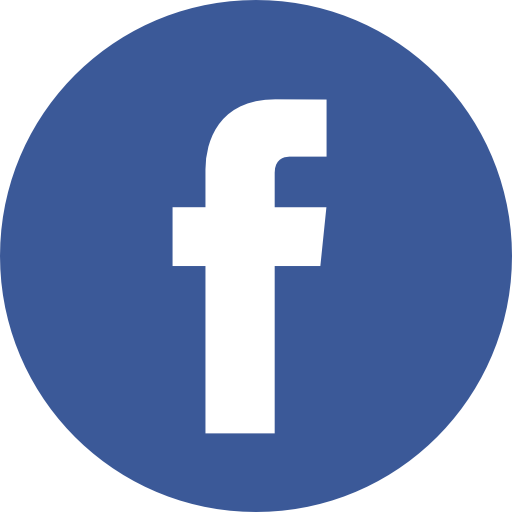 You can add troll or pandora beads for a unique personalised jewellery gift for any woman. This silver necklace you can truly make your own. This necklace has a silver heart bead and rondel bead. 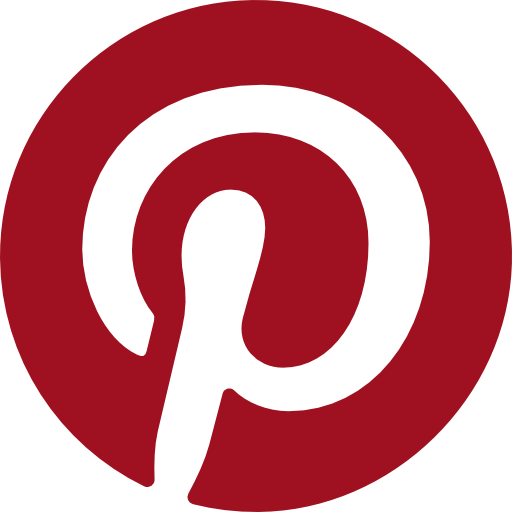 You can add troll or pandora beads for a unique personalised jewellery gift for any woman. This silver necklace you can truly make your own. This necklace has a white pearl and silver rondel bead. You can add troll or pandora beads for a unique personalised jewellery gift for any woman. 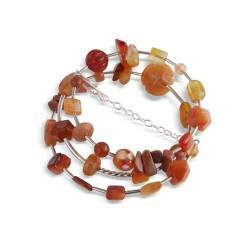 This carnelian pearl and silver necklace is simple contemporary but absolutely amazing. 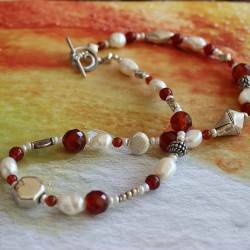 The carnelian contrast beautifully with the ivory pearls and different sterling silver beads. 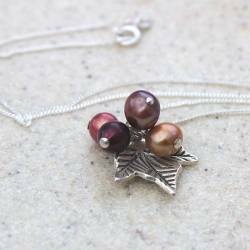 This vintage-style cranberry pink pearl necklace will look stunning on so many different occasions.Top-drilled pearls with a decorative Sterling silver toggle clasp with garnet and pearl dangles. For elegance you will always want to wear, either on your wedding day or to add the finishing touches to a more dress down day! A pendant with a bit of sparkle is teamed with a single white pearl. 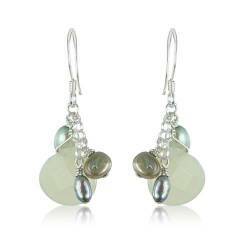 For elegant pearl jewellery you will always want to wear to add the finishing touches to your outfit. 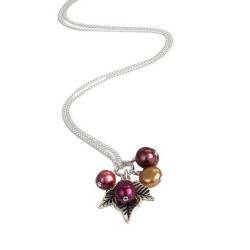 A star pendant necklace with a hint of sparkle is teamed with a single white freshwater pearl. Gorgeous orbs of faceted crystal on silver or gold necklaces. Gorgeous natural quartz necklaces to create a layered look. They are like mini disco balls! A gorgeous dainty crystal pendant with a sterling silver Chinese charm for love. It can also be personalised with an initial.Perfect gift for Valentines,birthday or anniversary to say you love her. This vintage-style green pearl necklace will look stunning on so many different occasions.Top-drilled pearls with a decorative Sterling silver toggle clasp with peridot and pearl dangles. Sparkling quartz crystal was "Krystallos" by the Greeks, who thought that it was eternally frozen ice. It seemed the perfect description for this crystal teardrop necklace. A leather friendship bracelet which can contain a hidden message in the golden round prayer box charm! The bracelet is adjustable so it will make the perfect gift as it will fit most people.